horza wrote: * System: PC. * Art style: Looks a bit like Paradox's "Runemaster"
* Gameplay: I've only read an article about it, so not sure about that. The thing that stands out though, and if you've played it or heard about it it will surely ring the bell, is that it promised a "realistic items stats" in which swords for example, don't have your regular % to hit, damage, etc. but instead have "blade quality", "weight", "balance" which would somehow yield its effectiveness in combat. I keep turning to "Runemaster" - which ticks all the boxes but can't confirm it also had that itemization, so i'm at a loss. Please help. Edit: Found an article on Runemaster. Locusinn.com wrote: Welcome to developer diary 5 for Runemaster where we focus on combat attributes! As you should know by now, Runemaster will focus on your hero in the quests and on the main map - but when the battle starts, your hero will be moved from the world map and into a battlefield when you encounter enemies. The battles of Runemaster will be turn-based, tactical battles based on a hex grid system. There your Hero joins his/her army and take active part in combat as a unit on the battlefield. And there are several combat attributes that govern how well the character performs during combat. Cannot imagine realistic item attributes with those on display. Yea that was my reddit post as well. It's not mount and blade, I've played that and wouldve remembered it. It seems it's not Runemaster either. Do you remember the magazine that the article was in? Sounds like Exanima or Sui Generis, but those are relatively recent games. Sui Generis was never released, and Exanima never made it out of early access and appears to be dead. Sounds like a Molyneuxed version of an RPG. I'm not saying that you absolutely couldn't make a worthwhile game using physical stats rather than jumping straight to derived/summary stats for weapons, but without some significant gameplay effect, which may, in turn, require more in-depth mechanics and more complex controls to support them, you're going to see the same effects as having weapon speed, hit chance and damage, but with the actual values obfuscated from the player, and more computational load to get there. New User wrote: Sounds like Exanima or Sui Generis, but those are relatively recent games. Sui Generis was never released, and Exanima never made it out of early access and appears to be dead. They both have the same premise, I think. It might've been a really early promise from one of the makers. Incidentally - if you look at their gameplay movies, they look like they're the same game so Exanima might be the reborn-into-early-access version of the failed Sui Generis. Yeah they are pretty much the same game. Sui Generis was supposed to be on a wider scale I think, like an open-world kind of game, but Exanima was just a dungeon crawler with the same engine I guess. Euro board game. Played it around 2013. It's a card only game, no board, no tokens if I recall correctly. It involves building inventions in different eras, and you can chain the builds together. I think there were 7 total eras. Inventions were grouped into color codes. You played the horizontally, not vertically, in front of you. Thank you! It's been bugging me for a while, and I just couldn't find the right search terms. One of my favourite games, I highly recommend it as long as you're prepared for a game that is more about navigating chaos than building a stable engine for incremental progress. I also highly recommend playing the revised rules for the Great People expansion; it makes the game play out much better than the Echoes rules of "just shuffle some in" did. Xanthir wrote: I also highly recommend playing the revised rules for the Great People expansion; it makes the game play out much better than the Echoes rules of "just shuffle some in" did. Oh yeah, I think those rules were retconned into newer versions of Echoes too. EdgarJPublius wrote: Something made me think of this cyberpunk-ish sourcemod I remember hearing about a while back. the story had something to do with a girl/woman with pyrokinetic abilities, possibly the main character? I'm just wondering if that rings a bell for anybody. So, funny story. I was spring cleaning my harddrive when I stumbled upon a large multi-part zip with a weird name. Opened it up and discovered a sourcemod called "G-String". That didn't ring any bells, so I searched it up and realized it was this very same sourcemod that I had forgotten the name of and tried to find five years ago. As far as I can tell, I downloaded it way back in 2011, never installed it, forgot the name and that I had actually downloaded it, and somehow it survived 7 years, getting moved from harddrive to harddrive along with a bunch of crap I just never paid any attention to. Background: It is an old tank war game but you dont control the tank. You buy different ones to confront the opponent. Perspective: Top-down view, cant remember if you played vertically or horizontally. Art style: Retroistic, with a war flair to it. Environment: You would play levels and each level would play on a different field. Genre: It was a strategy game i believe. Gameplay: You would be on the bottom of the screen and the ai at the top, but you have to scroll to reach him. You would earn money gradually and send different kinds of tanks and to his base. You would also build different towers to defend your area. Edit: Or Allied Star Police? The game is a third personal game, the main story of the game is that you get in a jail and they replace your legs with a ball alongside many others. there are many game mode but the objective of the one remember is to push the other players and stay in a marked place for sometime. Ball Breakers? Shows the Playstation version. Supposedly released it for Windows too. - The bad guys were also tiles - green, blue, red etc. based on what "type" they were. I also remember a special bad guy, which I think was called lava worm or blood worm (but I might have imagined this), made up of 5 bright red circles and running around like a train! That's about all I remember...fingers crossed! Thank you!! Bit earlier than late 90s - Crusher was late 80s/early 90s, and DOS. Perhaps there was a late 90s version, but you certainly played a white tile with a face, killing other tiles with dynamite, black background, blue walls. Not sure about slides à la Chip's Challenge, though. I've suggested it before, perhaps one of the other games is similar enough to jog your memory further. Was it definitely graphical, or was it ASCII graphics? I would be tempted to suggest Super ZZT, or possibly Kroz, but neither of those fit the "kill all enemies" criterion. It was definitely graphical. Unfortunately it was neither of those games, thanks for trying though! It looked much more recent I'd say. Deva wrote: Mentioned that later. PortgasDMana wrote: No. It was Pacman. I played it around 2003-2004 on the internet. I am looking for a game I played in my early childhood (born 1983). I will describe the things I remember about the game, but any number of them could be incorrect, I was pretty young at the time I played it, and I might not have understood everything correctly, or I might not remember things correctly. It was a space combat game, 2D, top down, with simple graphics, maybe line art. The player's ship was a small triangle, planets were circles, I don't remember if the shapes were filled or simply outlines, but I am leaning toward outlines. I don't think the planets moved, but I could be wrong (possibly they orbited a sun). It had very simple controls, I am pretty sure it was played with a keyboard, using the arrow keys. Up to accelerate forward, down to accelerate backward, left/right to turn clockwise/counterclockwise, something to fire weapons, maybe spacebar. It is possible the down arrow did not accelerate backward, that may have been one of the challenges of the game, only being able to brake by turning around and thrusting forward. I remember it used Newtonian physics, you could accelerate for a very long time, no friction, but would instantly die if you ran into anything at speed, and it would take an equally long time to brake. It may have taken place in a single star system, but maybe not. There may have been a sun at the center of the playable area. There may have been a map/mini map. There were enemies to shoot at, I don't remember a lot about them, I remember your ship shot straight forward. There were some type of upgrades to collect, I think there was a rapid fire upgrade, there may have been a shield upgrade, maybe a homing shot upgrade, possibly others. I think the upgrades were semi-permanent, lasting until death, though they may have been timed, or limited by ammo. I think the upgrades were dropped by enemies, but possibly they were static pickups, or possibly they were purchased with some kind of currency, or they were obtained by claiming planets (see next paragraph). One aspect of gameplay that stands out was landing on planets (and possibly moons). I remember it was a big deal, you claimed the planet in some way. Maybe it spawned allies, maybe it gave you an upgrade, or gave you a respawn or something. I remember it being one of the hardest things, at least as a child. I remember it being difficult to zero your velocity, because I think you were limited by the controls to only thrust forward and turn cw/ccw. You had to approach a planet slowly, and try to zero your orbital velocity, until you were just moving vertically relative to the planets surface, then you had to slowly let gravity bring you in, thrusting forward to brake. Finally you would land on the back of your ship/triangle. I remember it being very sensitive to your relative speed, especially tangential velocity, failure meant instant death. It is possible there was a lot more to the game that I did not understand as a child, but this is everything I remember about it. Thanks for any help you can provide in identifying the game. That looks like it, thanks! Description of the game : its a 2d game i think, you could choose between characters : i remember oe that could use an arc of with arrows made of ice, anther character that would use flames, and it was like an adventure maybe, i dont really have a lot of details in memory it was like 12 years ago, all i remember is that back then i really liked that game. 2d... how? Top down? Side scroller? Do you remember how he characters looked? Was it a flash game or a stand alone? Was it purchased or downloaded? * Year: Around 1992, i think it was before we got an Intel i486 but i`m not sure. * Gameplay: The main task was to collect keys. 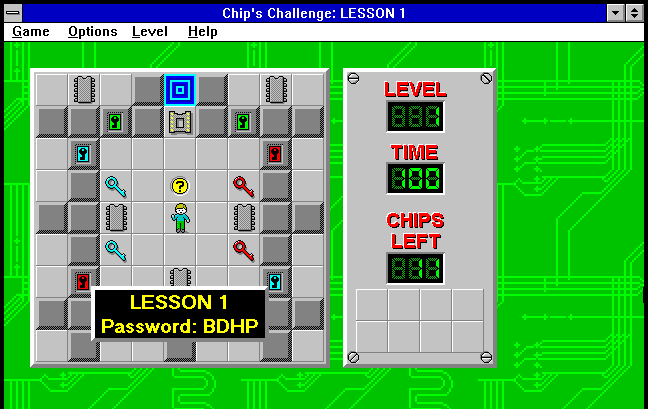 You were walking through levels and had to solve tasks to get to those keys. It was like Adventure for the Atari 2600 but newer with color. The keys were in different color i guess. Will mention Indenture too, as a game notably similar to Adventure. * Background: Possible some kind of space platform. Top down view. * Environment: please, see the attached GIF file - this is some of my memory imaginations about this game. I do not even remember how the character itself is looking (a blue ball "?" in the GIF attached) or what is the sense of the game. Landscape is some kind of space platform (the platforms and the background on the GIF are looking different in the real game). I remember some of the the bad-guys - some of them looks like a rotating brown peanut of volumed ellipse shape. It rotates around itself on his place and can do moves. If it moves to the character way - the character is moved in the turn the character was moved by this peanut. The charcter can move these peanuts (demonstrated on the GIF). If two of these peanuts are met - a new peanut will be borned (also demonstrated in the GIF). Possible, in game was a magnet - if the peanut is near a magnet - it will not moves anymore. Also, there were some sections on the platform - if the character pass through them they will be broken and a hole appears (not demonstrated on the GIF). The character can move a peanut to drop into a holes (demonstrated in the GIF) . Also this game has a level editor in game menu. Long time ago I viewed a lot (more than 1.5 thousands) of screenshots of various games, searched by a phrases in hope those phrases presents in that game's description - nope. There were answeres from this forum members - Robbo, Dimo's Quest, X-It, Switch, Chip's Challange - no one is right. So, maybe someone will remember the game after he/she see the GIF attached. I will be grateful if someone can remember this game. Was it perchance ZZT or Super ZZT? * System: Android mobile phone, definitely a paid game, around the $2-$3 range or so. * Year: Probably around five years ago? * Perspective: Tile-based top down puzzle game (similar to what a match-3 puzzle looks like). * Art style: Symbolic. Each tile had a different icon (definitely had a shield, sword, maybe staff, goblet? There were others). Graphics were not fancy at all. I think the app's icon is some sort of red/black skull icon? I think the skull was one of the tiles in the game. * Environment: The story is you're an adventurer going into a dungeon, trying to go down as many floors as you can. I'm pretty sure it had "Dungeon" in the name. * Mood: Dark I suppose. * Genre: Puzzle, tile-matching, sort of. * Gameplay: You would drag your finger adjacent tiles of the same symbol, trying to create the longest path possible, and thus getting the largest bonus - most damage, healing, etc.. I believe you could gain levels and become more powerful, similar to an RPG. I don't think there was actual equipment. There were definitely different classes. Standard D&D ones like cleric, knight, etc., but I think maybe also something like werewolf? Each class had a different ability you could use. Hello all, I am new here and have found this thread to be immensely helpful! I was hoping you all would be able to help me figure out the name of a game I used to watch my brother play. * Gameplay: I don't remember too much about it other than you play as a green or blue ball thing (might have been a ball with a face?) and it took place in space or the sky (background was black) and there were connected tiles with arrows on them and you basically rolled around as this ball collecting gems or crystals or stones..something like that. 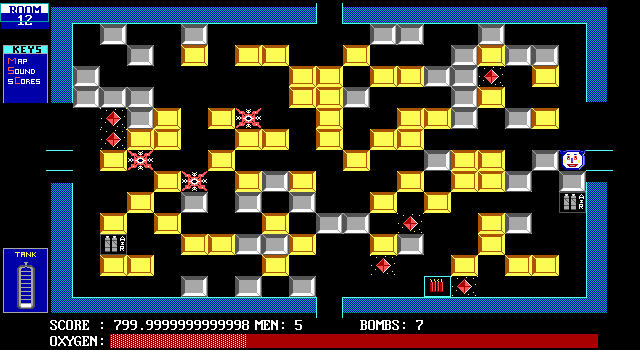 I remember that the controls were VERY sensitive and a majority of the game was spent falling off the edge of these tiles and having to start over at the beginning of the level. And I distinctly remember one of the obstacles being an 8 que pool ball that rolled around on the tiles that you had to avoid. One of the levels might have had ice tiles? I know it's far-fetched, but would appreciate any help anyone could give me! It has been driving me nuts for years and I can't find anything by searching! Could not have asked for a better screenshot. Oh me yarm YES THAT'S IT DEVA!!!!!!!!!!!!!!! Thank you so so much!!!! I've seriously been searching for this game for 6+ years! !